The Centers for Disease Control and Prevention said recent confirmed cases of algal toxins in municipal drinking water made people sick. For the first time in reported history, the Centers for Disease Control and Prevention confirmed algal toxins in municipal drinking water made people sick. The CDC said two separate outbreaks in Ohio could be traced back to drinking water from Lake Erie. In one of those incidents, 110 people got sick, and 400,000 people were forced to avoid drinking tap water. 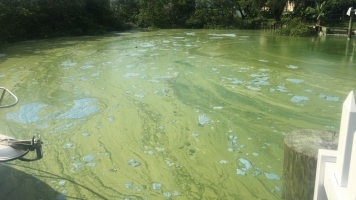 Harmful algal blooms often happen when fertilizer runoff enters warm, still bodies of water. Scientists think the warming climate might be making the problem worse, but the CDC says it's too early to know for sure. In the meantime, researchers at the National Oceanic and Atmospheric Administration have deployed a few new tools to help track bloom growth. A new weather satellite can detect much smaller algal blooms than before. And underwater, NOAA launched robotic laboratories at the bottom of Lake Erie to test toxin levels. They can deliver results about six times faster than humans.